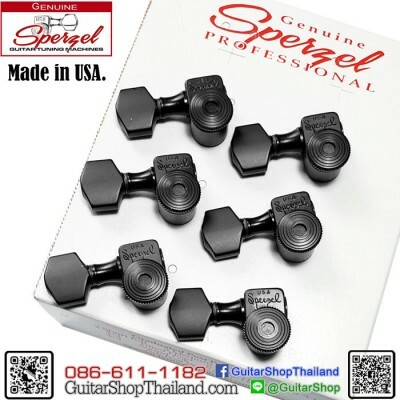 จำหน่ายลูบิดกีตาร์ Sperzel® ของแท้ Made in USA. 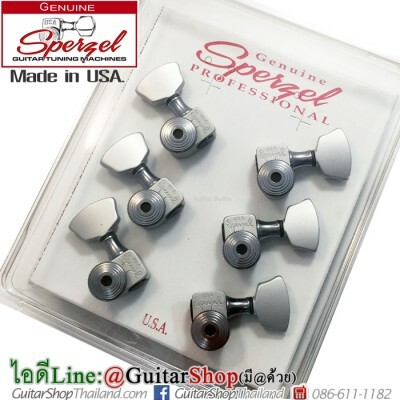 ลูบิดกีตาร์ Sperzel® ของแท้ Made in USA. 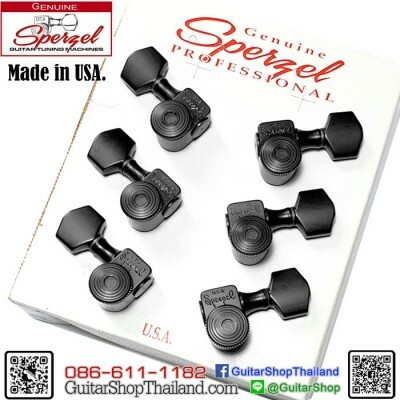 Condition: New ลูกบิดล็อคสายกีตาร์ Sperzel Trim-Lok Tuning Machine Heads Sperzel Trim-Lok Guitar Machine Heads Sperzel's rear thumbscrew locks the string, making these machines ideal for tremolo guitars.The string posts on 3x3 sets have graduated height (no string trees needed). Cast gear housings with sealed lubrication. Single pin mount keeps tuner from rotating, no mounting screws needed. Recommended for 1/2" - 9/16" (12.7mm - 14.29mm) thick pegheads.Model : .. 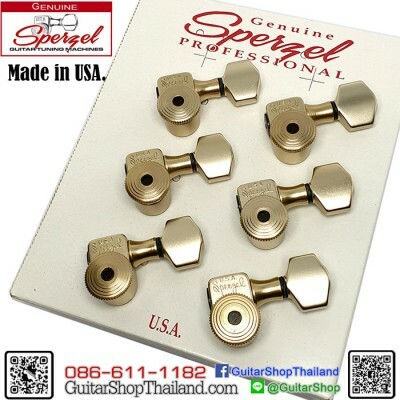 Condition: Newลูกบิดล็อคสายกีตาร์สีเงินเงา Sperzel Trim-Lok Tuning Machine Heads Sperzel Trim-Lok Guitar Machine Heads Sperzel's rear thumbscrew locks the string, making these machines ideal for tremolo guitars.The string posts on 3x3 sets have graduated height (no string trees needed). Cast gear housings with sealed lubrication. Single pin mount keeps tuner from rotating, no mounting screws needed. Recommended for 1/2" - 9/16" (12.7mm - 14.29mm) thick pegheads.Model :&n.. 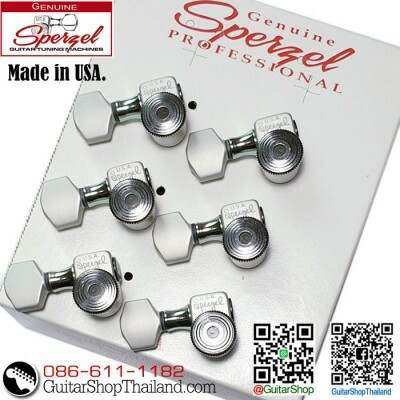 Condition: Newลูกบิดล็อคสายกีตาร์สีเงินด้าน Sperzel Trim-Lok Tuning Machine Heads Sperzel Trim-Lok Guitar Machine Heads Sperzel's rear thumbscrew locks the string, making these machines ideal for tremolo guitars.The string posts on 3x3 sets have graduated height (no string trees needed). Cast gear housings with sealed lubrication. Single pin mount keeps tuner from rotating, no mounting screws needed. Recommended for 1/2" - 9/16" (12.7mm - 14.29mm) thick pegheads.Model :&.. 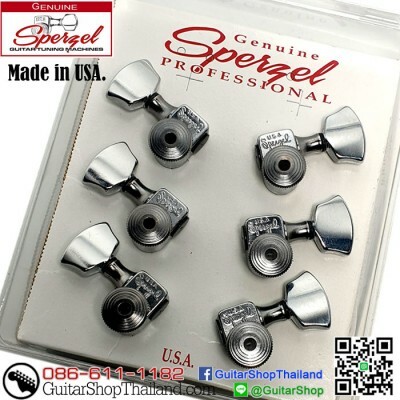 Condition: Newลูกบิดล็อคสายกีตาร์สีเงินด้าน Sperzel Trim-Lok Tuning Machine Heads Sperzel Trim-Lok Guitar Machine Heads Sperzel's rear thumbscrew locks the string, making these machines ideal for tremolo guitars.The string posts on 3x3 sets have graduated height (no string trees needed). Cast gear housings with sealed lubrication. Single pin mount keeps tuner from rotating, no mounting screws needed. 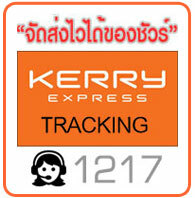 Recommended for 1/2" - 9/16" (12.7mm - 14.29mm) thick peghea.. 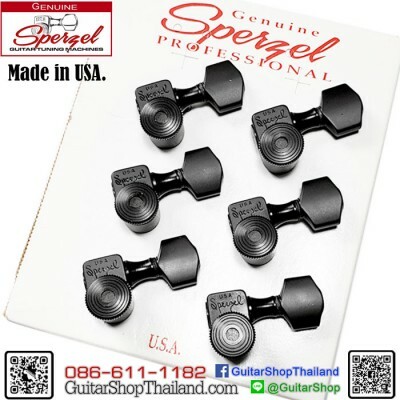 Condition: New ลูกบิดล็อคสายกีตาร์ Sperzel Trim-Lok Tuning Machine Heads Sperzel Trim-Lok 6-In-Line Guitar MachinesSperzel's rear thumbscrew locks the string, making these machines ideal for tremolo guitars. For 6-in-line pegheads.The string posts on 6-in-line sets have graduated height (no string trees needed). Cast gear housings with sealed lubrication. Single pin mount keeps tuner from rotating, no mounting screws needed. Recommended for 1/2" - 9/16" (12.7mm - 14.29mm) thic.. 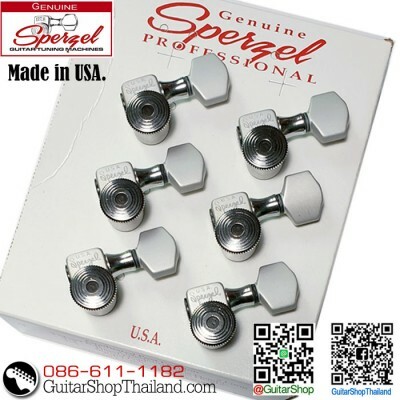 Condition: New ลูกบิดล็อคสายกีตาร์ซ้าย (หัวกลับ) Sperzel Trim-Lok Tuning Machine Heads Made in USA.Sperzel Trim-Lok 6-In-Line Guitar MachinesSperzel's rear thumbscrew locks the string, making these machines ideal for tremolo guitars. For 6-in-line pegheads.The string posts on 6-in-line sets have graduated height (no string trees needed). Cast gear housings with sealed lubrication. Single pin mount keeps tuner from rotating, no mounting screws needed. Recommended for 1/2" - 9/1.. 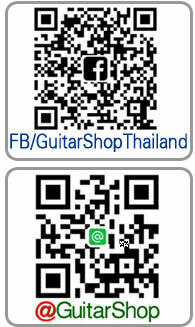 Condition: New ลูกบิดล็อคสายกีตาร์สีเงินเงา Sperzel Trim-Lok Tuning Machine Heads Sperzel Trim-Lok 6-In-Line Guitar MachinesSperzel's rear thumbscrew locks the string, making these machines ideal for tremolo guitars. For 6-in-line pegheads.The string posts on 6-in-line sets have graduated height (no string trees needed). Cast gear housings with sealed lubrication. Single pin mount keeps tuner from rotating, no mounting screws needed. Recommended for 1/2" - 9/16" (12.7mm -.. 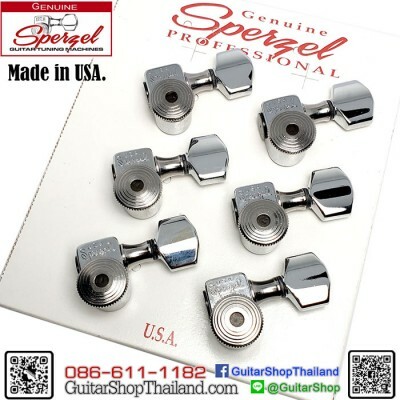 Condition: New ลูกบิดล็อคสายกีตาร์สีเงินด้าน สำหรับกีตาร์ซ้าย (หัวกลับ) Sperzel Trim-Lok Tuning Machine Heads Made in USA.Sperzel Trim-Lok 6-In-Line Guitar MachinesSperzel's rear thumbscrew locks the string, making these machines ideal for tremolo guitars. For 6-in-line pegheads.The string posts on 6-in-line sets have graduated height (no string trees needed). Cast gear housings with sealed lubrication. Single pin mount keeps tuner from rotating, no mounting screws needed.. 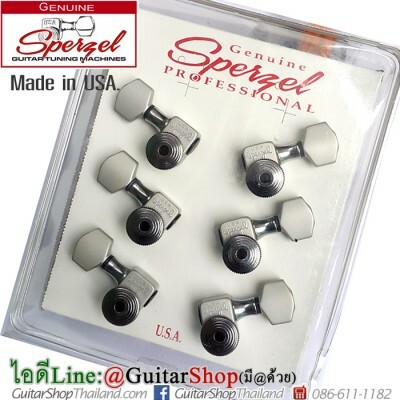 Condition: New ลูกบิดล็อคสายกีตาร์สีทองด้าน Sperzel Trim-Lok Tuning Machine Heads Sperzel Trim-Lok 6-In-Line Guitar MachinesSperzel's rear thumbscrew locks the string, making these machines ideal for tremolo guitars. For 6-in-line pegheads.The string posts on 6-in-line sets have graduated height (no string trees needed). Cast gear housings with sealed lubrication. Single pin mount keeps tuner from rotating, no mounting screws needed. Recommended for 1/2" - 9/16" (12.7mm - 14.2..